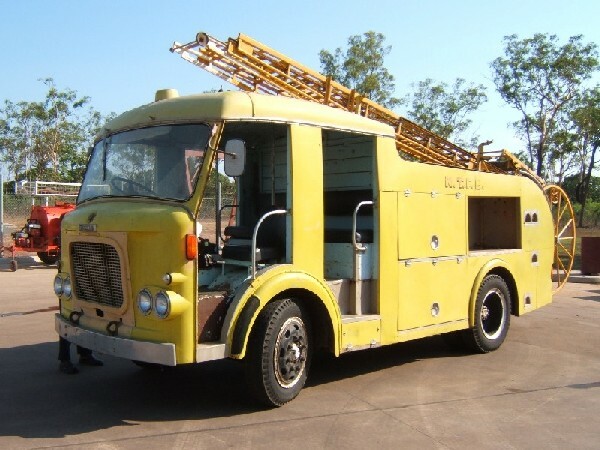 A 'tropical cab' Dennis F34 supplied to the Northern Territory Fire Brigade in Australia in February 1964. This appliance was discovered recently in Sydney, and transported back to Darwin for restoration. One of only 16 Dennis F34's produced, 2 came to the NTFB, 2 went to the New Zealand Fire Service, and the remaining 12 remained in the UK. Although supplied originally in red, the NTFB painted their appliances yellow in 1978. With the change of Chief Fire Officer in 1983, fire engines again became red, but this one missed out on a second colour change. It will again become red as part of the restoration. Lou, have just seen your photo of the yellow 1964 Dennis F34 Pump Escape and found it brilliant.I have pictures of the Dennis F49, and the Erf/Metz Turntable Ladder, but did'nt know there were anymore appliances in the yellow livery.I'd like permission to copy and maybe use in a publication(a book)if ever published, please.I've spent many years researching Australia and New Zealand and its fire services, and this classic picture is just great.Pete M.
Added by Pete Matten on 31 October 2007. Added by Lou Cowan on 01 November 2007. Lou, thanks for getting intouch.The pictures were very interesting and much appreciated.I bet that Dennis F34 was real brill when new.I'll be sending you an E.Mail in due course.Pete M.
Added by Pete Matten on 01 November 2007. Added by Pavel Zaremba, Western Australia on 11 November 2007. Added by Lou Cowan on 11 November 2007. Pete: FYI - I have seen a yellow-painted Dennis, in service, and in North America. It was way back when - the Dennis was in a Volunteer Fire-Hall, along with a miscellany of converted tankers and trucks - VFD's did a lot of DIY [Do It Your-Self] work then, as they often had to raise their own funds, as well. Catalina VFD, Nor'East Coast of Newfoundland, must have had an Automotive Painter in their ranks, or a local Body Shop contributing, in kind, to the community; as all the trucks were a uniform shade of yellow; this trend was just coming in, at the time - 1970's. I was just ashore from the ship, for a walk - the Fire-hall was all locked up and no one around. I recognized the truck, from Dinky Toys, and British movies/TV shows. It had the flat, 2-piece, "sad-eyed" windshield, similar to the F8 's in Picture 2291 and Picture 459. Always wondered how it got there - Newfoundland joined Canada in 1949. No way that a fishing Out-Port, like Catalina, could have afforded a brand-new Dennis in the 1950's. Added by Pat Rivers-Bowerman on 20 September 2008. Hello Lou,how's that restoration work coming along?,its been along time since we heard from you now mate.Keep us updated please with a progress report from time to time and pics please. Added by Pete Matten on 08 August 2009. Not much progress on Dennis yet. I have been busy with work and some other projects, as well as my volunteer firefighting as it is now in the high fire season in the Northern Territory. I have built a shed at home (my "fire station") to park Dennis in of the weather, so it is all just marking time for now. Added by Lou Cowan on 10 August 2009. I thing this is the PE I took photos of in Alice Springs back in 1979. The crew at the time said, no doors in summer ok, but on winters night you freeze on way to a job. Nice to think its still around. Added by Les S on 30 June 2010. Les S,come on then me old mate,where's the picture?.Is there any chance you might send a picture in please for us to see this Dennis PE whilst at Alice Springs. Because the NTFS operated 2 Dennis F34's,Alice Springs may have had the other one which might be the appliance you took a picture of. Lou,whats the latest on the restoration of this Dennis F34 mate,12 months now since the last up-date or since I heard from you.Note new email address please.Pete. Added by Pete Matten on 30 June 2010. Hi Les - this may possibly have been in Alice Springs, but the one you saw would probably more likely have been the Dennis F49 PE (same colour), which was definitely there. The Darwin crew also weren't impressed with the missing doors, as it was pretty uncomfortable in the wet season tropical storms. Restoration still hasn't started, but I have now completed the construction of my fire station to park it in. Added by Lou Cowan on 30 June 2010. Lou, woud I be right in thinking that the two F34's that went to New Zealand were purchased by the Wellington Fire Board in 1964 and 1966? I have one 1964 EU 3523 bodied by Chapman & Co and the other one bodied by Dennis? Added by Andrew Middleton on 22 October 2010. Hi Andrew - I am not really conversant with the NZ F34s, except that of the 16 produced by Dennis Brothers, 2 came to the Northern Territory in Australia, 2 went to Wellington in NZ, and the remaining 12 stayed in the UK. My F34 remains untouched and under cover, as I now have a 1949 Dennis F1 under restoration (as well as my 1958 Morris JB van). The F1 was supplied from the UK as a cab/chassis, and had a body made for it by the NSW Fire Brigade workshops before being delivered to Darwin in 1950. It was the first new fire appliance ever to be bought for the Northern Territory, as the earlier two Dennis Light 4s were second-hand, having been taken out of service in NSW before being depatched to Darwin in late 1941. I tried to post a photo of the F1 on this site a while back, but it wasn't accepted. I presume that it was because in its present condition it doesn't look like too much of a fire truck! Added by Lou Cowan on 22 October 2010. Many thanks for your help Lou. Added by Andrew Middleton on 23 October 2010. Added by SusanClime on 05 March 2019.